While I’ve been busy downsizing the amount of stuff in my home, one thing has still remained that seems to follow me from room to room. So when it was time to bring out the Christmas tree this year, I decided I’d leave the box and plunk in the tree! The idea worked great. The stand and everything fit as is. If I hadn’t been so lazy, I would have built a small platform to raise the tree a little higher, however… lazy won. As I was decorating, the big blank front kept staring at me in the face. It needed something. I attempted to hang licence plates, festive signs, and other junk relics but one thing kept hitting me. And that was Grit Antique’s kitchen island. I have loved this island FOREVER! 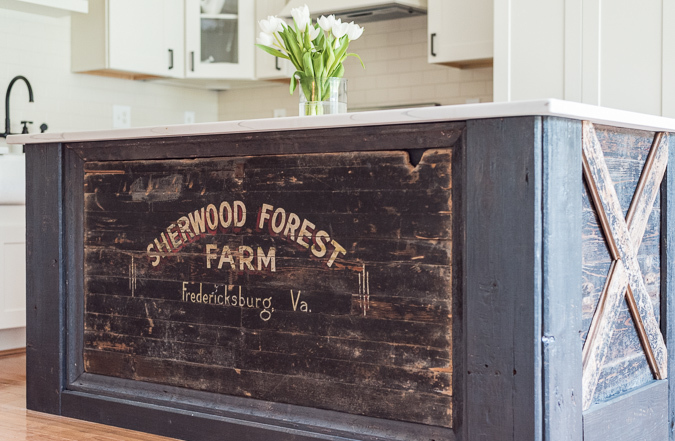 This post is a must-click so you can see the hanging barn doors on the other side. DECADENT. Anyway, after all my own flops, a stencil came to mind that I knew could somewhat resemble the look. Thank-you for the inspiration Jane! 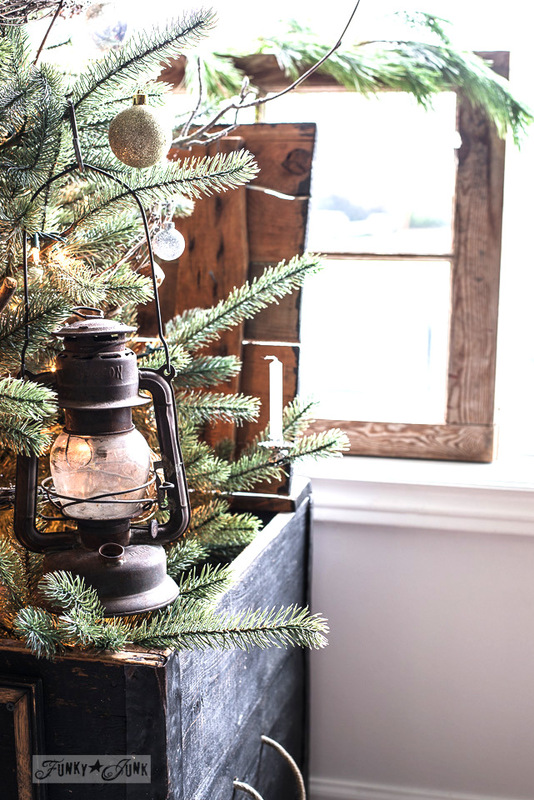 Who knew your island would ultimately connect to a Christmas tree of all things?! To get the lettered look, I used two stencils. Antiques was partly used, and the lines along the top of Bingo – large was next to give it a little more of a logo appeal. Being that the box was so naturally distressed, I attempted to mimic the same look with a barely- there approach with the stencil. Antiques could have been even lighter, however I was really happy with how the smaller letters turned out. 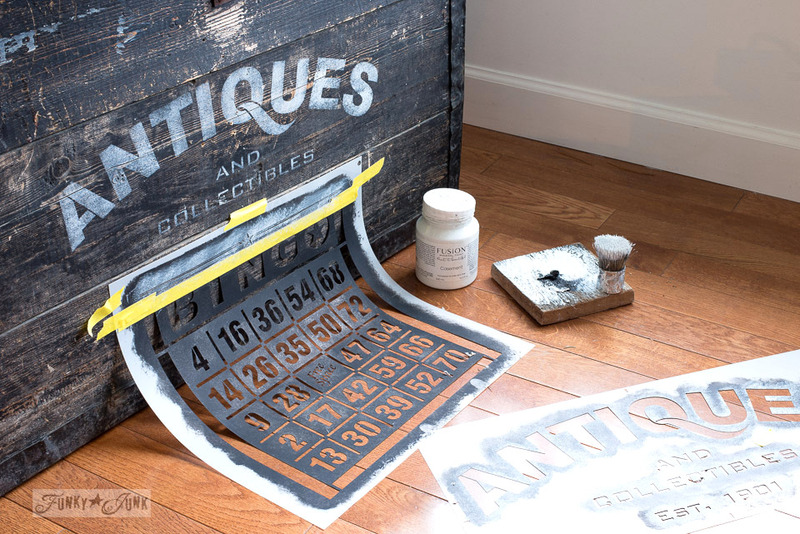 Tape the stencil in place, and using a very dry-to-the-touch paint loaded brush, tap on your design. Next up, an antique picture frame I had buried in the junk stash was screwed into place onto the crate creating more detail. It worked so perfectly! And this is why you horde junk, friends. Instantly, the tree had a theme! 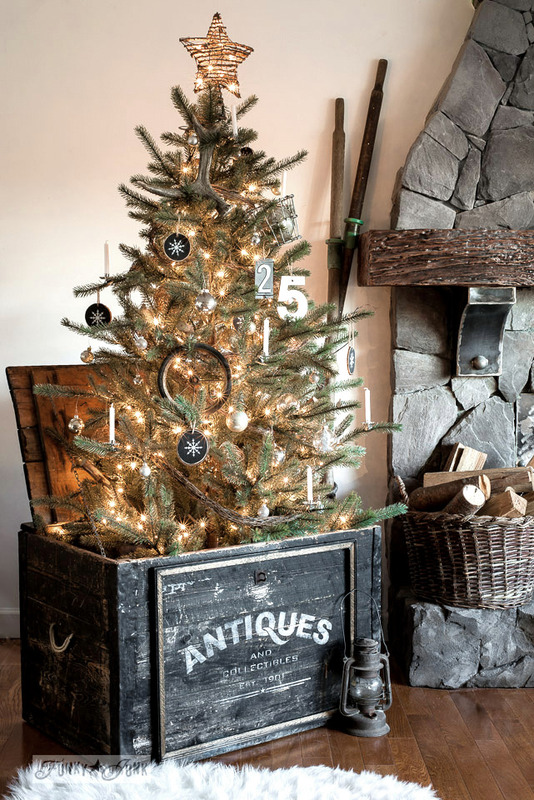 It was decorated with rustic branches, wicker garland, snowflake ornaments and of course, a few antiques thrown in for good measure. Tree is a faux from Ikea purchased in 2016 HERE last year. As much as I loved the tree in front of the window, pictures just wouldn’t cooperate. Right before I lost my mind, I decided to just move the tree where it would work, even if momentarily for the pictures. Well… that move proved to be a good one. My entire living room got a new look I’m pretty thrilled with! I’ll be sharing it soon. Thank-you fussy tree for not cooperating. The little candles in the clips are real and found at my local deli in town. While I don’t plan to light them, I felt they added a neat old fashioned detail. After the big tree move, while loving the neutral theme, the room lacked a tiny bit of warmth. So little bits of red are now infused here and there. 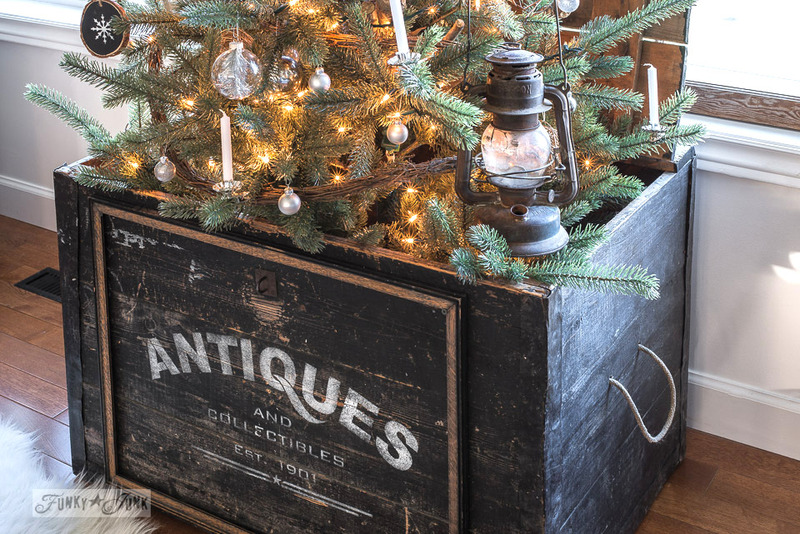 The little Christmas tree in an Antiques crate suits this place perfectly! Doesn’t it look like a Jack-styled Tree in the Box? I should have attached the grinding knob thing I have to the side. Hah! … and taken in the evening without the red ornaments. Tough call. I like it like this now too! Which way do you like it best? Regardless, I think this is my most fav tree setup to date! What kind of stand are you using this year? Donna, you amaze me with your kind heart and creativity. Your crate is beautiful and reminds us of our island which we love. Your crate would look really good over here…Lol! You need to design products for anyone who wishes to buy and not make their own! Thank-you Jane, for allowing me to be inspired by your own work on a daily basis. I could positively move right into your home (and barn) without changing a thing! just love it. and the idea of the frame on it…completed it. Oh my gosh! I shared your last years tree on my page this morning, and Jane asked me if I saw your 2017 tree. Now I see why. I wondered why it looked familiar, and then I scrolled down reading your post and bingo! There it was-Jane’s island. I show everyone I can that island, lol! First time I have ever commented here, but trust me, I want to be like your page, when my page grows up! Just love your tree, and tree “skirt” Merry Christmas! Aw, thanks for sharing Kim! Jane’s entire kitchen never leaves my head. I keep giving my own the stink-eye. I think it’s in trouble… haha! Well you sure took some good inspiration on this one! Jane has an awesome kitchen and you have great rustic taste too so between the two of you it was a win win. 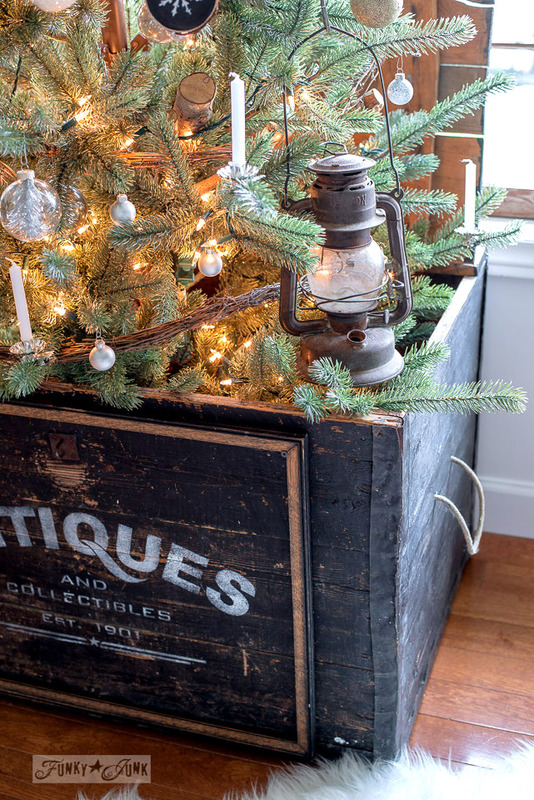 Love the crate and the tree is over the top! Loved how this turned out. I fell in love with Jane’s island from first time seen it. You did an amazing job Donna, it’s adorable. I love this black storage chest. However, the amazing thing to me is not the stencil and tree, but that this box was empty and could be used! At my house it would be jammed full of stuff! You really are decluttering your house! Another one of your wonderful ideas! I so love your ideas. Oh Donna, what a WONDERFUL idea! 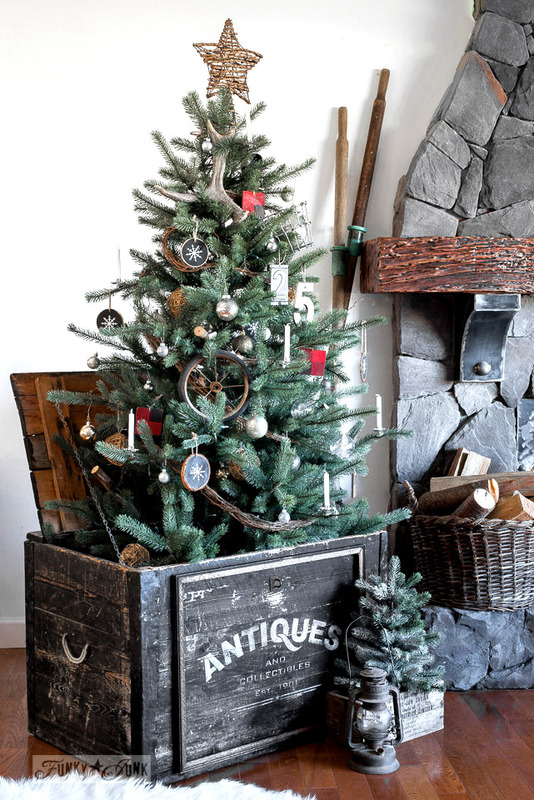 I bought a smaller (5 ft) imitation feather tree and built a smallish table to put the tree on, but your idea of putting the tree in the wood box is genius. I have a small wood trunk in my guest room that just sits there and does nothing. My tree would fit in it! 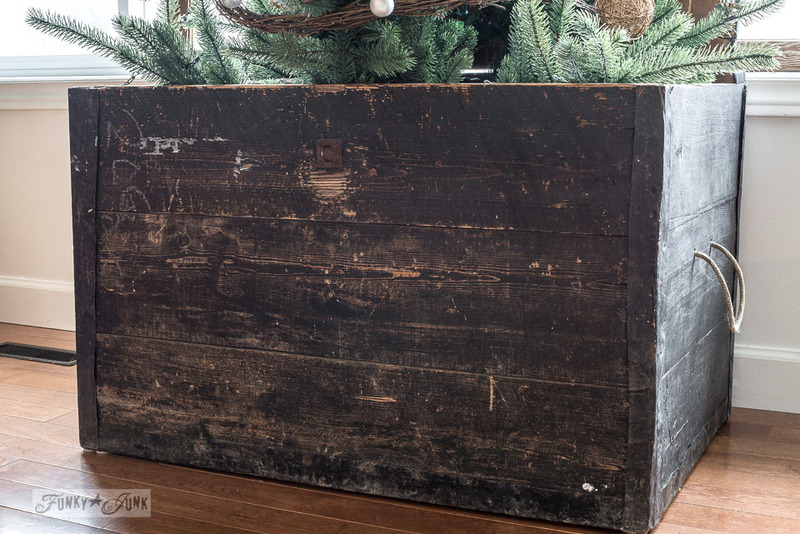 I will be dragging the trunk into the basement for some stenciling later today!!! Thank you! Oh my… that sounds amazing AND I’m also sorry for the extra work Sharon! haha Honestly, giving new life and use to something you’ve had in storage will breathe new life in you too! I hope you share the results with me, I’d love to see! You are so right Mary! Right after I read your comment, I nodded in agreement and promptly removed the red ornaments. That was easy! There are pops of red elsewhere in the room and here was yet another reminder to not be so matchy-matchy… I really much prefer unintentional looking decor. Thanks for the nudge! Your tree is absolutely amazing! I think that it is the most creative that I have seen on line. Love it! So cute! Tree-in-the-box! Love it and the stenciling. What a gorgeous vintage look!! I’m going to pin this. Haha! This entire house appears to be their bedroom… they also still have their very tall cat tree they prefer over anything else. Glad the inventor of those things knew what they were doing! For the last few years we didn’t have a Christmas tree and I didn’t miss it. Now that I see your awesome tree, I want one again. 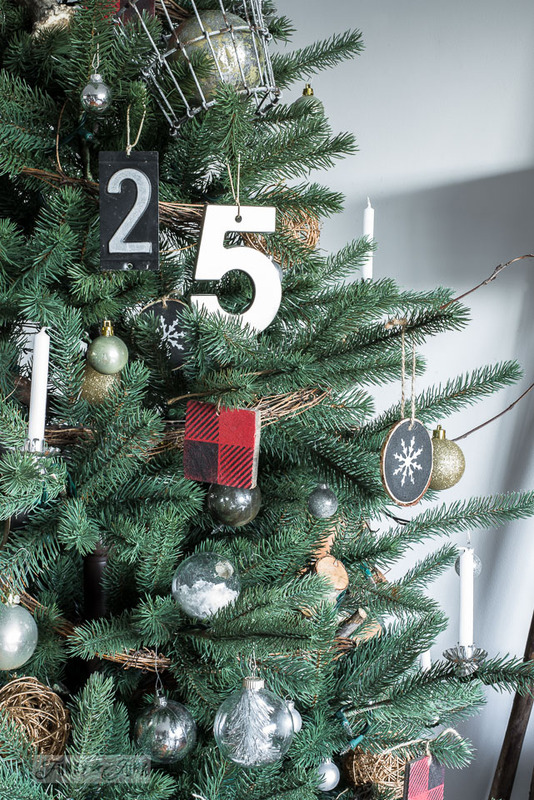 One in a beautifully stenciled black box, decorated with numbers and snowflake ornaments. Yes, I love your tree, Donna. This year we can’t have one though because of our youngest cat. Maybe next year. 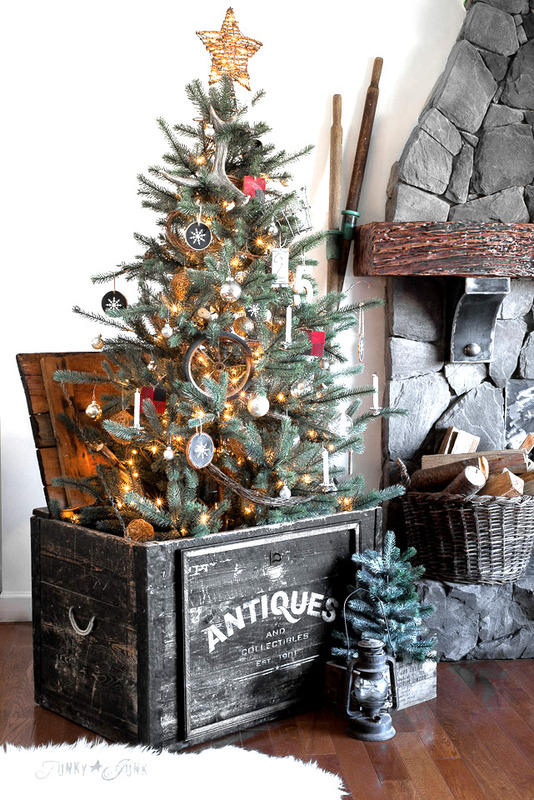 Love the tree and using something different to hold it. 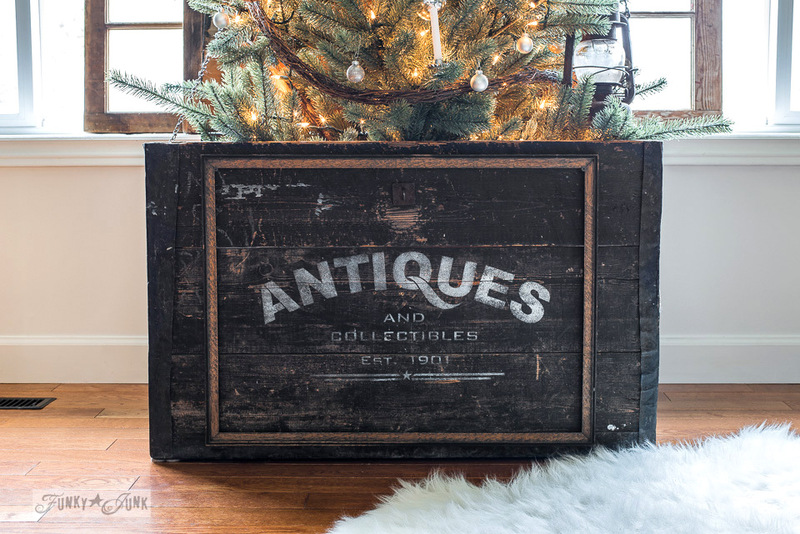 I think I would distress the word Antique a little more so it has similar time-worn gouges as the box does and also raise the tree up just a little bit. 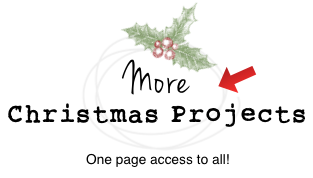 Hope it’s ok to share my idea on your already fantastic one. Cheers!